The user interface in NMS consists of modules-panel from which the user can prepare any workspace, adjusted to the needs of a particular system and operator. The user is not restricted by the software and can customize the interface to his liking. Even such details as the content and the form of the information displayed on the background image (OSD) can be adjusted. What is important is that the adjustment of the workspace (the number and the arrangement of panels) is assigned to individual operators. 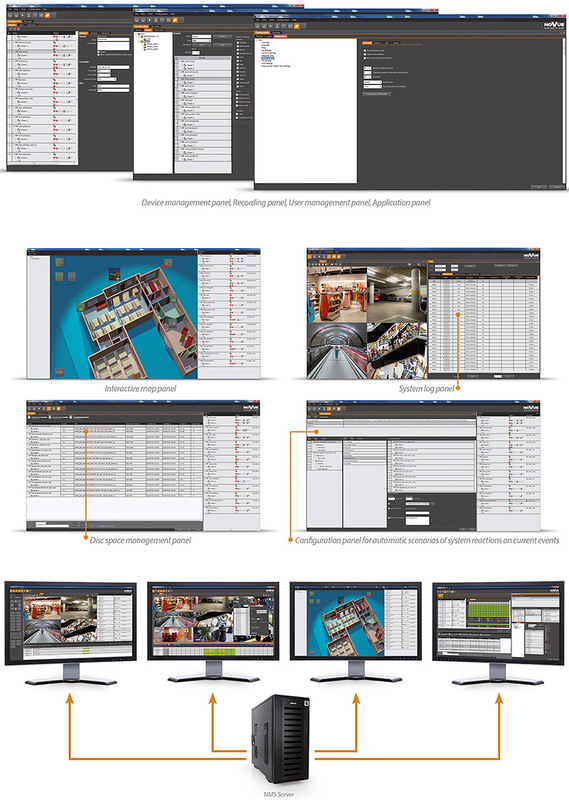 When it is necessary to use many functions at the same time, multi-screen operation is very useful (simultaneous display of application on multiple monitors). Installations maps in NMS allow quick and intuitive access the image from cameras by using icons. Icons symbolizing cameras and system elements (alarm detectors, magnetic contacts, sirens, etc.) are placed on the map. Clicking the icon of the selected element can immediately display an image from the camera or start predefined building automation component. 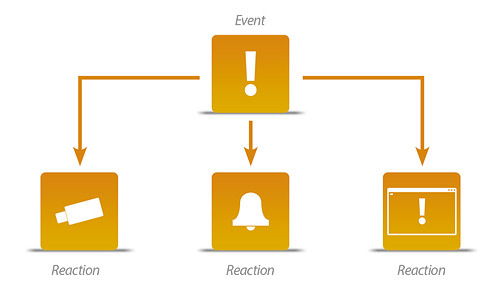 Signal icons informs on a regular basis (by changing the color) about events associated with the elements thus allowing for quick assessment state of the installation. The visualization feature is particularly important in complex systems composed of dozens of cameras located at different locations of the installation. To search them by name on the list of devices is much less convenient than finding a suitable location on the map visualizing the installation. It is helpful to divide complex systems into several subsystems and create separate maps (the user can move between them by using links similar to the ones used on websites). With an intuitive editor creating a map is fast and easy. As a background of the map any picture (in any graphical format) can be used. It can be a picture of the installation, plan of the building or convenient for the user visualization of the installation. On the background of the map icons representing monitoring system elements are placed. All icons can be found in a special toolbox. The appearance and placement of icons can be edited without any limits. In order for map to become interactive all icons should be "linked" to corresponding elements of the monitoring system. Therefore, when the user clicks on the selected icon, an image from the camera assigned to it will be displayed. NMS allows the user to create extensive systems with multiple server and client stations. To protect the servers against unauthorized access NMS is equipped with mechanisms for controlling incoming connections from client workstations. For each server a list of allowed IP addresses (that can connect to it and receive video streams) is determined. With this feature, even if a password is stolen, it is not possible to connect to the server from any other station than dedicated client workstation. Different levels of access to system resources can be defined for each user. For different users of the same camera a different set of privacy zones can be set. The administrator has the access to view the all recordings of that camera. One of the major advantages of IP video surveillance systems is the possibility to record images in high resolution (1 Mpx, 2 Mpx, …). NMS software allows the user to receive, record, playback and send to client stations streams in resolutions from CIF to 8 Mpx. Cameras with different resolutions can be easily combined within a single system. This allows the user to invest in a more expensive megapixel cameras only in places where they are really needed. To use the full potential of megapixel cameras and extract the important details from the image it is good to use the digital zoom function. 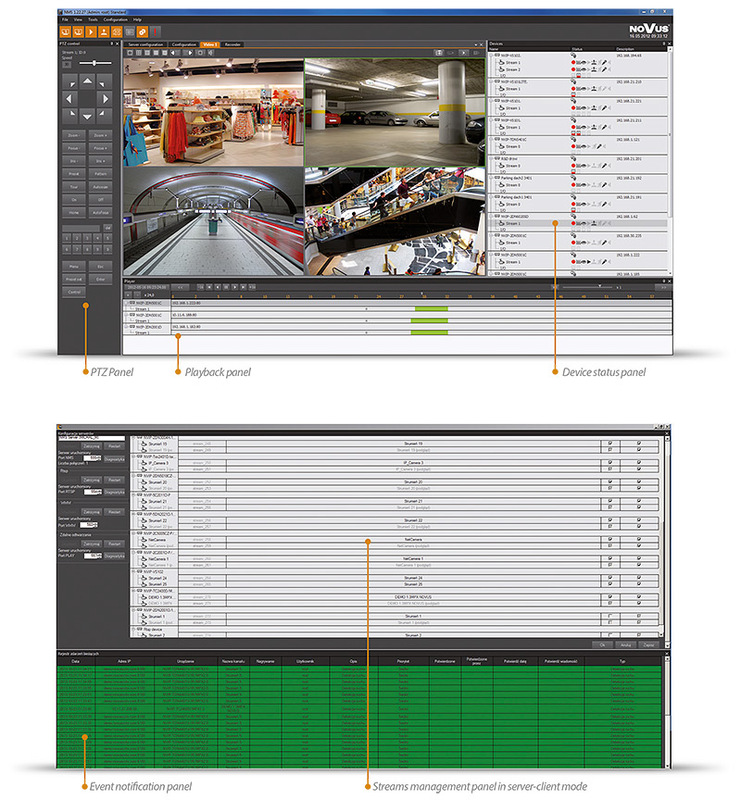 NMS software enables efficient use of advantages of multistream cameras. The application allows the user to manage each camera stream separately. This allows the user to create a system in server-client architecture, where streams of high quality and resolution are recorded locally, while streams with lower parameters are sent to the remote client stations via the Internet. 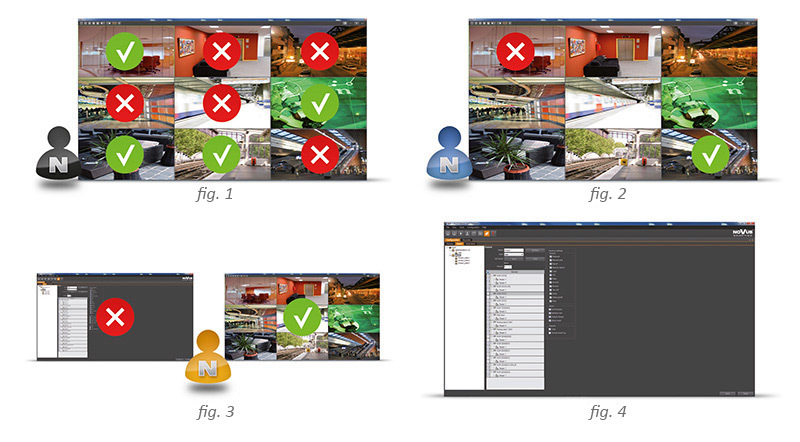 NMS offers a very extensive configuration module for IP cameras streams recording. Most importantly, the video from each camera can be recorded with separate settings. Recording can be carried out continuously or only when an event occurs. NMS allows the user to record a "full" stream or only the base frames (e.g. from the cameras of lesser importance). Recording mode is configured in advanced schedule settings. Because of the independent assigning of disc space for each camera separately, the user can also adjust the recording time from the camera. For more important streams more disc space can be assigned, and thus, their storage time will be longer. The operator receives information about the estimated registration time of individual streams based on the amount of disc space allocated and recording settings selected. 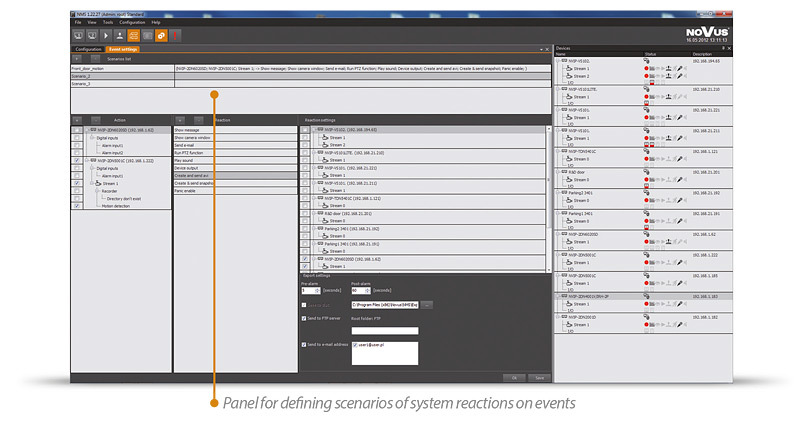 NMS software allows the user to create a list of automatic reaction scenarios to events. As a result, the system supports the operator or replaces him completely in unmanned systems. Software can inform the operator or system administrator about events in different ways. NMS can also cause certain interactions between system components. Intercom bell is connected to the digital input. When pressed, the system can automatically send an appropriate preset to the rotating camera, so that a visitor is shown. At the same time an operator at reception is alerted by a sound signal and camera image showing the entrance is displayed on his screen. When a motion detection event is occurring in a room with limited access, the system will always notify the person in a senior position via SMS and e-mail. The schedule of events and "timers"
Alarm scenarios can be implemented based on a schedule. 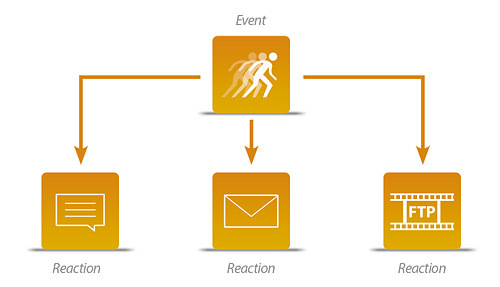 Each action-reaction scenario can be assigned to a specific time of day or a specific day of the week by the user. "Timers" allow the user to activate the predefined response once on a specified time or periodically every minute, hour, day, or week. NMS software offers effective methods of searching and playback. A special panel is available for the user so he can view the database of recordings and monitor playbacks. The most important part of this panel is a graph which by colors shows on the timeline different types of recording. Graf can be scaled, allowing the user to quickly navigate through the recordings of the whole day and to search for recordings (with an accuracy of a few seconds). During playback following functions are available: accelerating and slowing down the playback, frame by frame and backward playback. An interesting feature is the ability to simultaneously display the recordings and "live" image from the cameras. This allows the user to compare recording with the current view from the same camera. There is also an option to search the program registry for specific events and view the recordings related to them. The administrator can specify a time limit for recordings playback for each operator (e.g. only the recordings from the last 10 minutes, the last two hours or the last day). An important role of the software running as a monitoring system is to inform the operator about important events occurring in the system. The key to effective cooperation between operator and program is to provide all relevant information and not a single unnecessary. The excess of information can decrease the operator’s alertness and can result in ignoring important data. NMS – unlike many other programs – can very precisely determine which information is to be displayed on the screen, and which is only to be registered. In the example given very important information is displayed on an orange background while less important on is displayed on green (it might as well not be displayed at all). The operator can add a note to each event and thus confirm the information. When there is a multiple workstations configuration at one location it may be that most of their settings are identical or very similar. 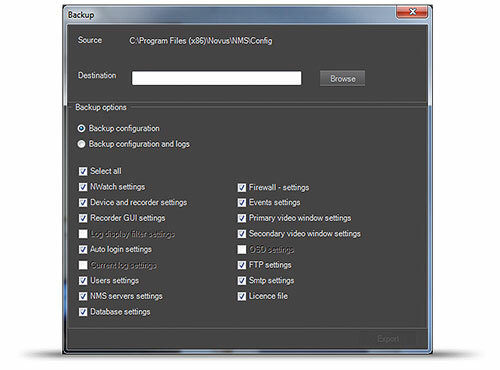 To enable the reuse of once made settings a special settings backup module was created in NMS. Thanks to precise division of settings into a number of thematic modules the user can efficiently use the previously saved configuration and create the desired combinations on the spot.